east of the Rockies, with an elevation of 3551 feet above sea level." "In altitude above sea-level, this is the highest point on the Southern Railway System and the greatest attained by any railroad in eastern North America. 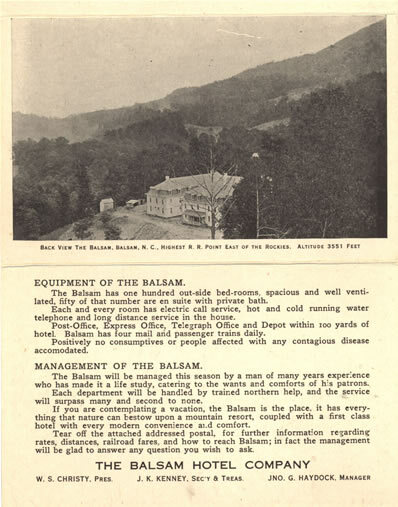 In recent years Balsam has developed into a resort for health-seekers, the salubrity of the climate and the purity of the water, together with its picturesque location, making it ideal in this respect. Accommodations may be obtained by tourists at a good hotel. Visitors are attracted to it by the grandeur of the surrounding scenery and the more adventurous among them find enjoyment in mountain climbing." "Within three-quarters of a mile from the station to the West is Balsam Gap, a wonderful cleft in the mountains of the same general altitude as the village. Within a radius of five miles of the station are several of the notable mountain peaks of western North Carolina. Fine views are to be obtained of Pinerock, Plott Balsam, Jones Knob, which towers to a height of 6,000 feet, and other mountains on the North; while to the West rises Water Rock Knob, 6,400 feet high. Rising one after another to the Southeast are Wessner Patch Bald; Licklog Gap; Flat Gap; Cansey Fork Bald, 5,926 feet; and, as a climax of these stupendous mountains, Lone Bald, whose summit is 6,076 feet above the sea. "The Balsam Inn is being finished ready to open for guests the 10th of June. It will be under the management of Mr. J.G. Haydock of Georgia. A larger crowd of summer guests are [sic] expected here than ever before. Balsam is a pleasant place to come to in the summer season. The climate is so cool and healthful. There are two good hotels here, some private boarding houses and several cottages open for summer visitors." "From Balsam the descent of the Railway is quite as sharp as the ascent was on the western side of the mountains. Less than a mile from the station the line between Jackson and Haywood Counties is crossed, 35.6 miles from Asheville and 87.5 miles from Murphy. The first station in Haywood is Saunook, 33.3 miles from Asheville and 89.8 miles from Murphy. It is a small way place, chiefly notable because of its immediate proximity to Pinnacle Knob, which towers into the clouds a mile, almost perpendicularly from the station." 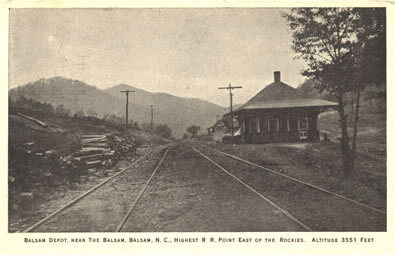 Built between 1905 and 1908, the Balsam Hotel was located near what was touted as the highest railroad point east of the Rocky Mountains. For its 1909 season, the hotel indicated it had “one hundred out-side bed-rooms, spacious and well ventilated, fifty of that number are en suite with private bath.” In addition, all of its rooms had “electric call service, hot and cold running water, telephone and long distance service in the house.” According to the tour guide Summer in “The Land of the Sky”: Resorts Along the Southern Railway (1915), the Balsam Hotel had a capacity of 250 guests and charged an average board of $2.50 day or $12.50 week. Jno. 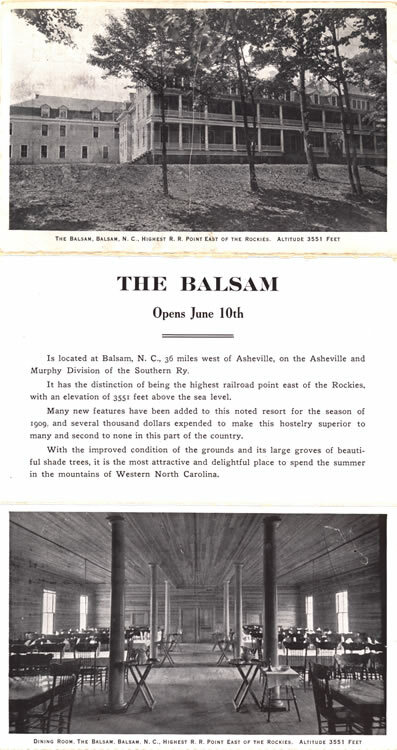 G. Haydock, mentioned in the Jackson County Journal (Sylva, N.C.) newspaper article quoted previously, is listed on this postcard as Manager of the Balsam Hotel Company for the 1909 season.